(HONG KONG, 6th November 2015) Kadoorie Farm and Botanic Garden (KFBG) is pleased to have The Honourable CY Leung, GBM, GBS, JP, The Chief Executive of the Hong Kong Special Administrative Region, The Honourable Paul Chan Mo-po, MH, JP, Secretary for Development, The Honourable Bernard Chan, GBS, JP, Chairman of the Advisory Committee on Revitalisation of Historic Buildings to officiate the opening of the Green Hub (Old Tai Po Police Station), today. The Old Tai Po Police Station in Hong Kong is a Grade 1 historic building, built in 1899. 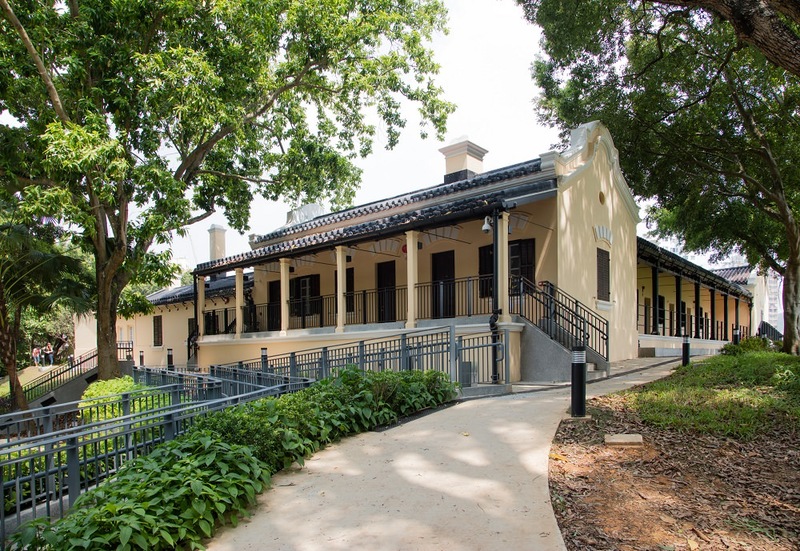 Under Batch II of the "Revitalising Historic Buildings Through Partnership Scheme" (Revitalisation Scheme), the Development Bureau has collaborated with KFBG to transform the heritage site into a "Green Hub for Sustainable Living”. The Green Hub demonstrates how we can live sustainably while at the same time respecting nature and each other. enable the building’s role to evolve – KFBG has transformed this vacant site of former colonial authority into an organically-evolving cultural site that reflects how a community may live sustainably. The Green Hub project team strives to co-exist with these valuable features of Old Tai Po Police Station, and also demonstrate low carbon practices. For example, over 60% of the built-area at the Green Hub is operated with natural ventilation only for energy conservation; and 100% of the organic waste generated by horticulture activities and Eat Well Canteen is composted and reused to enrich the soil on site. The Eat Well Canteen strives to serve each meal with the smallest eco-footprint and the Co-op Shop works closely with producers and partners who promote what they believe, through their products. Regular workshops are held for members of the public to learn practical skills and traditional knowledge for sustainable living. Part of the building is given over to a Heritage Exhibition showing aspects of the architecture of the Old Tai Po Police Station and the life in the New Territories. The design of the Green Hub guestrooms reflects the beauty of simplicity and allows residential guests to appreciate the original architectural features. During their stay at the Green Hub guests may enjoy healthy, low carbon meals at our Eat Well Canteen, join our heritage tour and visit the small, local shops nearby, or join a field course to explore healthy and sustainable living more fully. The Green Hub runs re-skilling workshops and thematic short courses; and hosts sustainability retreats and 3- to 5-day Transformative Education Courses taught by leading international teachers. “The Green Hub project revitalizes the historic Old Tai Po Police Station with its new mission, as a hub to serve our community in meeting this need in a timely way. This project has demonstrated the principle of participation as a method both of awareness-raising and making progress towards genuine sustainable development,” Barretto adds. The Green Hub has been open since 3rd August 2015 and by 30th October 2015 over 8,261 people have visited the heritage site. Self-guided: This option is walk-in for groups of five or less, though advanced booking is recommended as the site capacity is limited.